Camping is great. Fresh air, visible stars, the scent of a fire and scalding hot melted marshmallows. But when the sun goes down and the temperature drops, you are going to need something to illuminate your surroundings, especially because night time is always darker when you are away from the light pollution of the city. Camping lanterns are a great way to banish the darkness. 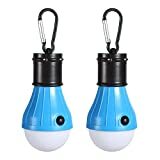 They illuminate more than just the unidirectional bulb of your flashlight, and they can be propped upright or hung in a way that ensures your artificial sunshine is available hands-free. Depending on how far you have to hike to your campsite, how long you will be in the wilderness, and your personal energy preferences, there are several options available on the market. Below, we have highlighted our favorite two battery-powered lanterns, our two favorite rechargeable lanterns, and our two favorite solar-powered camping lanterns, and our two favorite propane lanterns. Make sure that you never spend a night outdoors without one of the following lanterns by your side. Battery powered camping lanterns are generally long lasting, and you can easily carry extra batteries with you for when your first set runs out. This is a great solution for anyone who wants an easy, lightweight way to keep your nights illuminated for a long time. Each of these lanterns requires three AA batteries and can last for up to 12 hours of regular, continuous use. The LED light bulbs are cool and bright, and the entire lantern weighs only 9.14 oz. It is collapsible when not in use, which makes it a fantastic solution for backpackers or anyone looking to minimize the amount and bulk of their luggage. These lanterns actually resemble indoor light bulbs. They each come affized to their own carabineer, which makes them easy to hang from the inside of your tent. Each bulb takes three AAA batteries. With just one push of the singular rubber button, you can switch the mode from full light to half light to blinking. These bubs come in four fun colors, so you can choose a set that matches your other camping equipment. 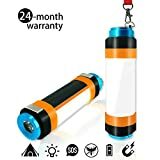 If you don’t want to constantly be worrying about your battery supply, then a camping lantern that recharges with a USB is a great option for you. These lamps are great for short trips. This lantern does not look like a traditional camping lantern or an indoor light bulb. Instead, it looks more like an over-sized glow stick. One side is a magnet that can easily affix to iron objects. The other end has a clip that allows it to easily be hung from the roof of your tent. On one charge, the lamp can last for 8 hours with continuous use or 16 hours with intermittent use. This is a great option for weekend camping trips. 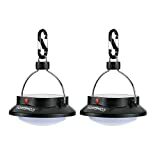 This lamp can only be used effectively by hanging it from the roof of your tent, but it is bright enough to resemble the overhead lighting from your home. With a fully charged lantern, you can operate it on high for 4 hours, on medium for 14 hours, and on low for an astounding 300 hours. The remote control on and off controls even work through the walls of a tent, so you can turn it on from the camp fire before you even head to your tent to sleep for the night. This is a great option for anyone looking to bring the creature comforts of home outside with them. Depending on where you are camping, solar energy can be plentiful throughout the day. If you are going to be in a sunny place, then make that sunshine work for you at night by utilizing one of these solar powered lanterns. This little lantern collapses down into a small disk with a large solar panel on top to harnesses all of that solar goodness. At night, it expands into a cylindrical omnidirectional lantern. 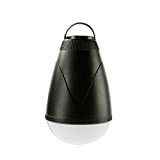 It has three lighting modes: high, low, and SOS, and can last for 5 hours, 10 hours, or 6 hours respectively. It also has a USB output, so you can use the solar energy captured to charge your phone! This is a great option for backpackers in sunny locations. These are primarily hanging lanterns, and come affixed to their own carabineers. The top of the lanterns contain solar panels, but they also have a reserve rechargeable battery in case you get stuck somewhere without sunlight. It comes with three light settings: high, medium, and low. They cast a warm, white light. If you are really looking to go old school with your camping trip – you can grab one of these propane tanks and a set of matches and stay away from light bulbs entirely! This lantern is tall and comes with a stable base. It lights with matches and one cylinder of propane will keep the lamp ablaze for up to 14 hours. The included hardcover case ensures safe and easy transport, and with a trusted brand like Coleman, you really cannot go wrong. If you don’t want to carry matches, this self-igniting propane tank is your best bet. 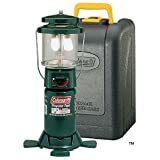 The base holds a 16.4 oz disposable propane cylinder, and the heat-resistant glass globe and heavy duty steel handle mean that you can easily transport the lantern, even when lit. So decide which lantern is best for you and never fumble around a dark campsite again. Oh, and don’t forget your power station!